North American Bigfoot: High Five's All Around! 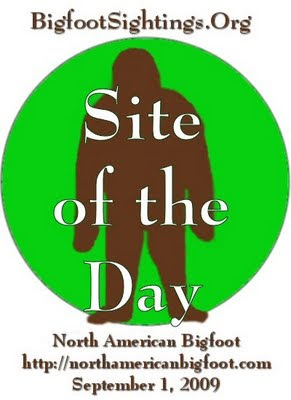 Linda Martin of Happy Camp, CA sent an email today notifying me that http://www.northamericanbigfoot.com/ has been chosen as the Bigfoot Sightings Site of the Day! I accidently ran across Linda last June. A group of friends and I were traveling from an expedition near Cave Junction, OR on the way to Bluff Creek when we ran into Linda at the local market in Happy Camp, CA. She was kind and generous with information, and later posed for a picture with my motley crew. Linda's review of my website can be found at this link, or you can read it below. Thank you for the props, Linda! Cliff Barackman’s website is fairly new, but packed with fascinating information. For example, he’s installed a unique index of Bigfoot footprint casts giving the specs on each including the place it was found, the size, the date, and the name of the person who discovered it. There’s so much to see on this site I wasn’t able to read it all in one day… but I’ll be back. There’s an ongoing Bigfoot research blog associated with this site that I’ve only read a few entries of. I may feature that separately in the future, because I really want to read it all. 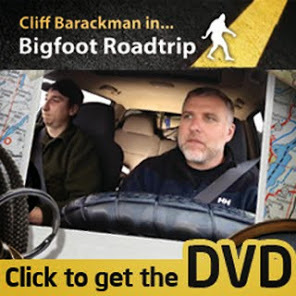 Cliff Barackman has been involved with Bigfoot research for at least fifteen years and currently has three ongoing Bigfoot study areas in Oregon. His comments about the kinds of things that go on there are fascinating. He’s also got articles on the site — I couldn’t read them all today but went down the list until I saw A Place for Amateurs and figured that was the article for me. It was very encouraging, giving practical suggestions for a scientific approach to Bigfoot research. Speaking of encouragement, I met Cliff during the summer of 2008 when he came through Happy Camp (you can see the photograph on my blog post about Tom Yamarone) and he said something that was very encouraging to me. I was wondering how I should develop my approach to Bigfoot research and he said something to the effect that my blog was fine as it was - as being someone in the Klamath River area commenting on local sightings. A little bit of encouragement is very helpful, and Cliff, if you ever read this, I want to thank you for that! Other articles on this site will appeal to more experienced Bigfoot researchers: Thermal Imagers in Bigfoot Research and A Case for Infrasound are a little too high-tech for me but may be exactly what you need to read about. More my speed, The Ten Essentials of Bigfoot Data Gathering lists practical items like a tape measure and latex gloves — things I can afford and know how to use. Cliff included a section on the cultural impact of Bigfoot, recommending books, movies, artists, and musicians. Take a walk on the wild side… and if you have questions look at the Bigfoot FAQ. There are some Bigfoot videos on the site you may not have seen before. There are also Bigfoot sound recordings he’s collected during his Bigfoot research activities. For a new site, this is very comprehensive, but that is a reflection of his years of experience. 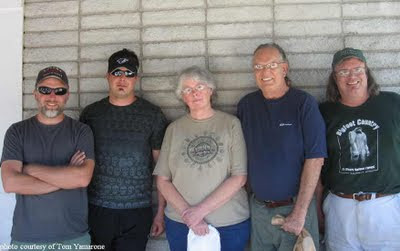 If you want to be involved in Bigfoot research, this is definitely a site worth taking the time to read.